To make a garment which you would like to wear again and again means that it has to fit your body and compliment it. It is not that difficult to do if you have a pretty standard body and a garment you chose has a classical style. If it is not your case, much safer to make a paper pattern to be sure your garment will fit you exactly when it is finished. I have a misfortune of being not standard. All the schematics provided with patterns just don't work for me. That's why I've always had my own a small-scale pattern for each project since I began to knit and crochet. I think it is not a bad idea to have a full-scale paper pattern in case you are going to make a garment which is not classical and requires some special adjustments. Here is my experience. I buy the cheapest knit fabric ( it is pretty stretchy similar to a hand crocheted/knitted fabric), pin a full scale paper pattern to the fabric, outline it, and cut the pattern pieces remembering about seaming allowances. After the pieces are seamed together, one can easily see what kinds of alterations are necessary to make a garment fit exactly. What do you need to make a garment pattern? You will need a helper to do 10 measurements. Look at the picture for the corresponding numbering. 1. Bust circumference. Measure around the fullest part of the bust. For calculation we will use 1/2 of this measurement - BS/2. 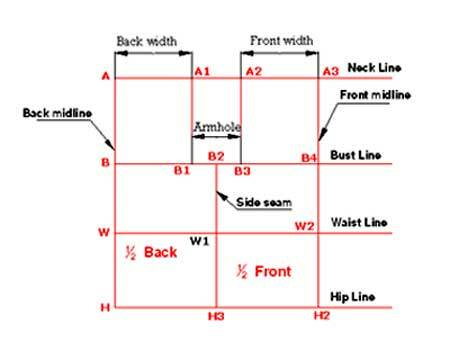 To make a garment pattern base grid. 1. Schematic pattern is designed for knit and crochet garments. Doesn't work for sewing projects. 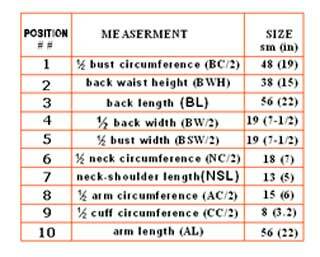 2.Works the best for the patterns with bust circumference (BS/2) no more than 50 cm (20 in). To make a pattern for some particular project, choose proper page from the "Related Pages" below. Make a Sweater: How to make a set-in sleeves sweater pattern. Crochet Top: How to crochet a sleeveless top of motifs. Cardigan Sweater: A drop-shoulder cardigan for women. A Baby Sweater: Make your pattern. Step-by-step instruction. Crochet Slipper Pattern: Granny square project.